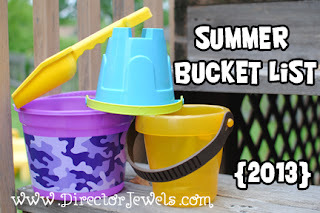 Summer is done and we are working on our favorite things to do in fall, but there's still one thing left from our summer bucket list that I forgot to share! 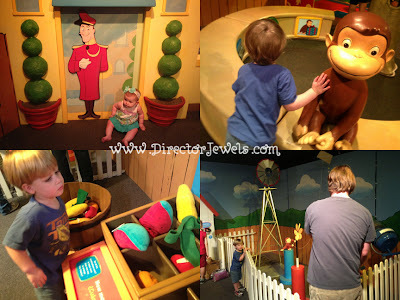 We had so much fun when we visited Crown Center for Lincoln's birthday earlier this year that we wanted to have another adventure. 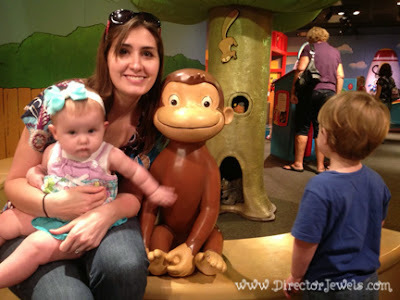 The free exhibit for kids over the summer months was Curious George: Let's Get Curious! George is one of Lincoln's favorite characters right now, and we actually had planned to get there more than once - as it was, we visited a couple days before the exhibit closed just after Labor Day. Lincoln was pretty excited just by the entry! This exhibit was really fun, but unlike Funville - which was good for all ages, seemed to be geared more toward young school-aged children. There were lots of things to experiment with, like learning how things move and how shadows work. There was a tiny mini golf course and a craft station. It was all really neat, but a little outside Lincoln's scope of understanding. Regardless, Lincoln had a grand time running around the exhibit and he was less than pleased when we had to leave. 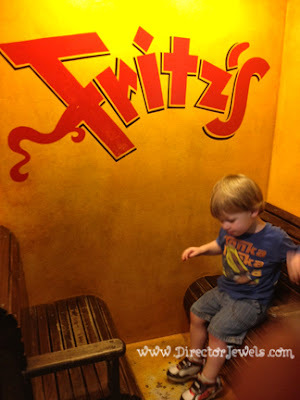 Next we headed to Fritz's for an early dinner. I don't think the novelty of this restaurant will ever grow old. 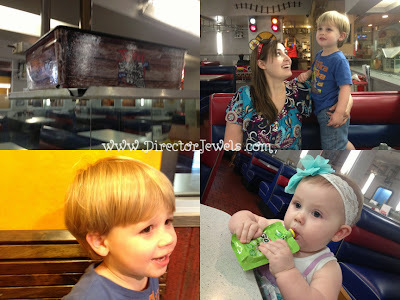 You place your order by phone (at your table), and your food is delivered by train! 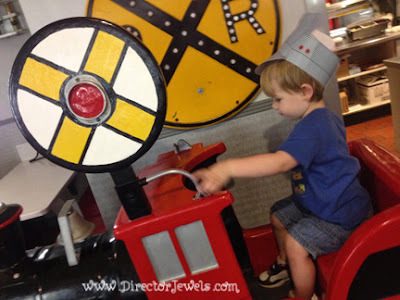 We visited at a time of day when the restaurant was not very crowded, but the kitchen staff sent some trains around the room randomly every now and then. It was a huge hit. 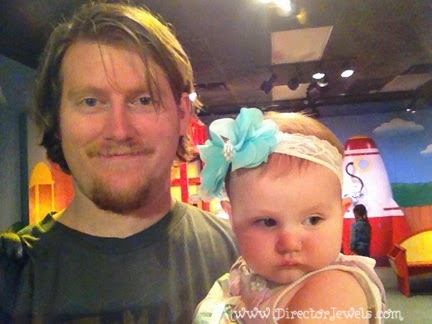 Lincoln was even more excited than the last time we went! For our vehicle-loving boy, this place is just about perfect. He devoured most of his chicken nuggets and fries while Addie scarfed down the ever-popular GoGosqueeZ applesauce packet. 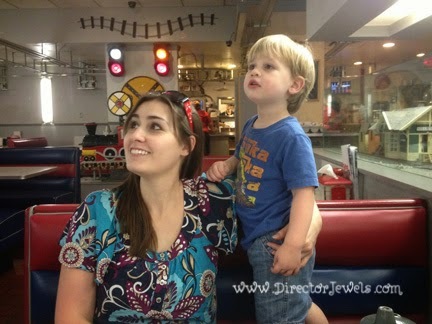 We didn't have any change, but he was happy enough to just sit in the train ride. What a cute little engineer! All in all, it was another successful family adventure!